Hate Seeps In – Patrick F. Clarkin, Ph.D. In the United States, the current ecology of ideas appears to be growing angrier compared to past decades. People are pretty polarized. 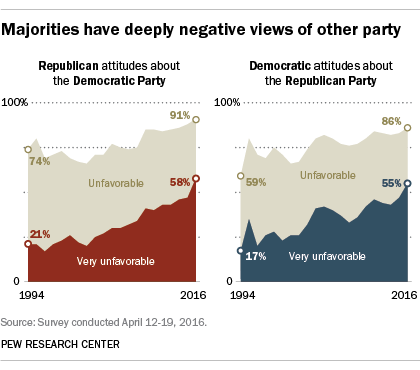 In the last two decades, divisions between political parties in the have widened steadily, with the majority of Democrats and Republicans seeing each other “very unfavorably” by 2016. I don’t know today’s exact numbers, but I’m pretty certain that this polarization has grown since then. Worse still, 45% of Republicans said that Democratic policies “threatened the nation” in 2016 (up from 37% in 2014), while 41% of Democrats saw GOP policies as a threat (up from 31%). Again, I would guess these divisions are even greater today than in 2016. Political violence in the U.S. also seems to have increased. In the past few months, politicians and pundits have argued over whether the behavior of Democrats protesting and publicly confronting elected officials is tantamount to that of a mob. One man was arrested after threatening to kill journalists at the Boston Globe for a coordinated editorial that criticized President Trump. Another man in California tried to stab Republican candidate Rudy Peters. Right-wing organizations have been filmed beating people in the streets, with some of their leaders publicly advocating violence. Then, of course, came the bombs that were mailed to at least ten Democrats and people who have drawn the ire of President Trump, including former President Obama, Hillary Clinton, and CNN, allegedly by an outspoken Trump supporter in Florida. The FBI reported that hate crimes have also risen significantly in the past few years. A white man in Kentucky killed two black people in a grocery store, minutes after trying to enter a Black church. And then there was the horrific shooting deaths of at least eleven people in a synagogue in Pennsylvania, targeted by a man (again, white) with a lengthy history of anti-Semitism. Journalists have been body-slammed, harassed, attacked, called “enemies of the people,” even murdered. This list is incomplete, but things are pretty messed up right now. 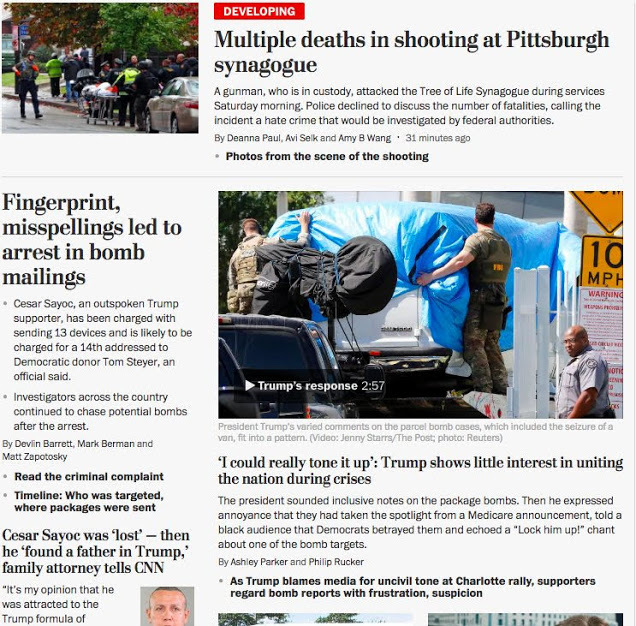 Screen shot from the Washington Post in late October 2018. I’m trying to find some reasons to be optimistic for the future, even though it is not very easy. Perhaps I’m writing this precisely because it’s not easy. I think it’s important to remember the spirit of Mandela’s quote above, that hatreds don’t simply come out of nowhere. Rather, they have to be developed, stoked, or fomented. In other words, we should remember the time dimension here – which isn’t always easy, given that time if often invisible to us – rather than deluding ourselves into thinking that today’s animosities are eternal, fixed, and irreversible. Of course, it will take an enormous effort to repair them. I’ve written before that it makes sense that as a social primate species humans evolved with some basic emotional and cognitive abilities to allow us to navigate our social environments and to help us form bonds with others. However, as is true of virtually everything, all paths have tradeoffs, and there are downsides to social bonds too. For one, we tend to think that the bonds and social networks that we are closest too are more important than others’ bonds. Sometimes there can be clashing interests, even violence, between social networks (gangs, nations, religions, fans of different football teams, tribes, etc.). But I think these clashes are historically particular, not an automatic given. Evidence suggests that empathy with others’ suffering comes fairly easily to us, even if the other person comes from an “other” group. The exception is when historical animosities and biases developed over time preclude that empathy. Yet, if animosities can be developed, then it stands to reason that they can be reversed as well. Likewise, Nicholas Christakis and James Fowler (2007) found that obesity can also, in a way, be contagious, spreading throughout a social network. In the longitudinal Framingham Heart Study, they found that a person’s chances of becoming obese increased by 57% if they had a friend who became obese in the last three decades. The spread of obesity in a social network over time. Source. “A behavior has just occurred. Why did it happen? Your first category of explanation is going to be a neurobiological one. What went on in that person’s brain a second before the behavior happened? Now pull out to a slightly larger field of vision… What sight, sound, or smell in the previous seconds to minutes triggered the nervous system to produce that behavior? … What hormones acted hours to days earlier to change how responsive that individual was to the sensory stimuli that trigger the nervous system to produce the behavior? And by now you’ve increased your field of vison to be thinking about neurobiology and the sensory world of our environment and short-term endocrinology in trying to explain what happened. This grand view, looking at an array of levels, makes perfect sense. Everything counts. We can’t just say that a violent act can be attributed solely to our evolutionary history, or an angry ecology of ideas, or a gene, or any single factor. But they can all be involved. However, the one that is most variable, or ablest to be manipulated, is the social world. We can do this for good or for harm. Unfortunately, it doesn’t take much to polarize people. At the root of all human interaction, people somehow intuit an answer to the question “does this person intend to cause me harm or not?” Our answers come from an array of clues, including appearance and whether the person has any markers of aggression (a scowling expression, a tattoo that says “I hate group xyz”), a person’s or group’s reputation (whether fairly or unfairly earned), and influence from others such as gossip and propaganda. There is some evidence that the polarization we’re seeing today is at least partly manufactured. People will always see the world differently, but those differences can be exacerbated. Kate Starbird at the University of Washington noted that the Russian Internet Research Agency created fake online personas that caricatured Americans on both the political left and right, presumably to divide people and foment anger. 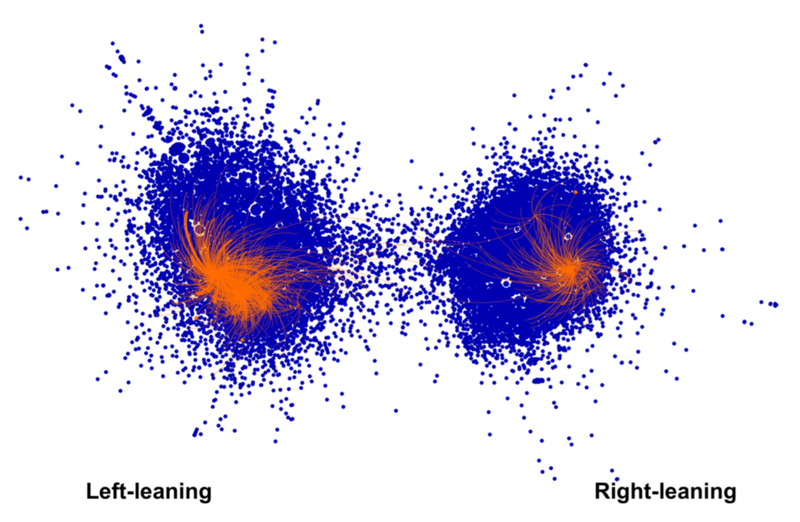 Russian Twitter accounts (orange) impersonating U.S. activists on both the left and right. Source. Perhaps I should have given this post a different title. Maybe hate doesn’t just passively seep in. Instead, it can be intentionally injected into the bloodstream. The question is whether we are wise enough to recognize it, to try to inoculate ourselves against it, and try to solve our very real social problems more constructively. Christakis NA, Fowler JH. The spread of obesity in a large social network over 32 years. New England journal of medicine. 2007 Jul 26;357(4):370-9. Luhrmann TM, Padmavati R, Tharoor H, Osei A. Differences in voice-hearing experiences of people with psychosis in the USA, India and Ghana: interview-based study. The British Journal of Psychiatry. 2015 Jan;206(1):41-4. MacAndrew C, Edgerton R. 1969. Drunken Comportment: A Social Explanation. Chicago: Aldine. Sapolsky R. 2017. Behave. The Biology of Humans at Our Best and Worst. Penguin. Scheibe, K. E. 1970. Beliefs and Values . New York: Holt, Rinehart and Winston. This entry was posted in Cooperation and conflict, Psychology, Social Networks. Bookmark the permalink.